Hackamore bridles do not have a bit, and instead control the horse with a noseband. 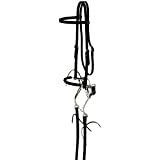 The classic hackamore has a "bosal" noseband, which is made of braided rawhide. 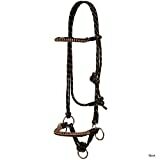 The hackamore bitless bridle is used in trail and western riding, and also for colt training.